My mother called this “chambaut”, and that’s the phonetic spelling. She said it meant mixed up pot, in what language I can’t say. She never wrote down the recipe since it was just something she made when there were plenty of eggplant and zucchini in the garden. She might have also added some cooked potatoes to the mix. In a wide (3 quart) pot saute the eggplant, then the zucchini in olive oil for a couple minutes, until lightly browned. In the meantime, in a large frying pan over medium heat saute the onions, peppers and garlic until beginning to soften. Finish with the remaining basil. Mom would have added a tablespoon of butter. Adapted from the Craisins package. In a medium bowl combine oatmeal, flours, baking soda and salt. Stir and set aside. Cream butter and sugar together. Add eggs, one at a time, blending well after each addition. Slowly add flour mixture until well combined. Stir in cranberries and chocolate chips. Drop by rounded teaspoonfuls onto ungreased baking sheets. Bake at 375ˆF 10-12 minutes. This recipe was inspired by my dear friend Shari. This is such a forgiving recipe, if there seems to be too much filling, just pile the stuffing a little higher. Lightly oil a shallow casserole dish and arrange the mushrooms, bottoms up. Brush the mushrooms with canola oil or melted butter. Heat 2 tablespoons of butter and/or oil over medium heat in a non-stick pan. Saute the celery and carrots for a few minutes. Add the chopped onions and continue to cook until softened. Add the chopped mushroom stems and herbs. Continue to cook until soft and beginning to brown. Mix sauteed vegetables with bread crumbs, salt and a sprinkling of paprika. Bind the mixture together with the milk or cream, about 2 tablespoons. The mixture should be moist but not wet. 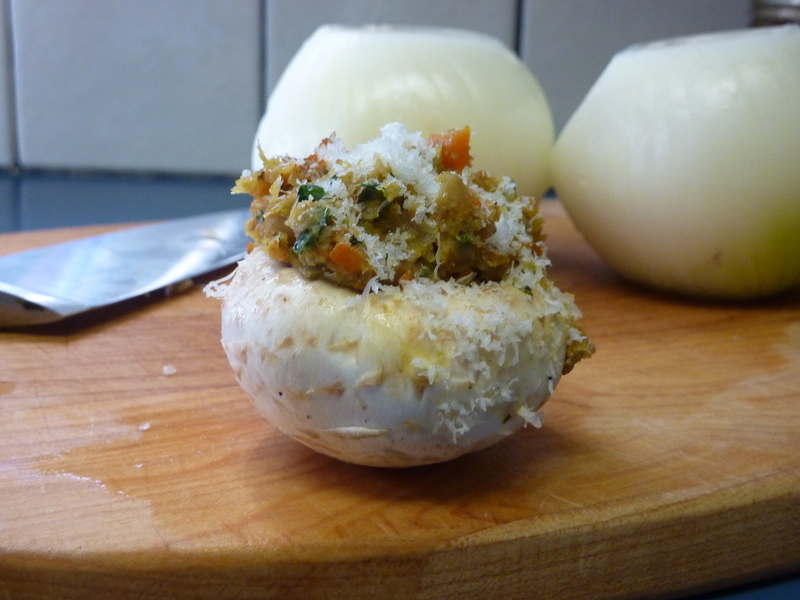 Stuff the mushrooms and sprinkle with paprika and some grated Romano cheese. Bake at 400˚F about 20-30 minutes until the mushrooms are tender and the top begins to brown. I like to make this salsa with raw tomatillos. If you prefer, you could cook them in boiling salted water for about 10 minutes, drain and then proceed. Place all in a food processor and pulse. The mixture should have some texture. A friend of my husband’s gave us this recipe. It works well and is delicious. Lay out all ingredients on table with butter on top. Allow to soften for 15 minutes. Work with hands until dough is like putty. Roll out about 12 at a time about 1/2″ thick. Cut in desired shapes (need deep cookie cutters, about 2″ across) and prick with fork. Bake on ungreased cookie sheets in 325˚ oven for about 20-25 minutes. Remove when just turning brown on edges, and allow to cool briefly on cookie sheets. They will brown up. Note: Shortbread should only be made in cold weather, as the butter softens too fast in warm weather, making cookies tough. Wash rice. Soak in water about 30 minutes. Cook. Put cooked rice in a large bowl and combine with sushi su, fanning mixture. Use while warm. Someday I will find the cookbook that this came from and give it the proper citation. Combine all except the olive oil, whisk in the oil to emulsify. Stir all ingredients together and allow to marinate at least an hour. Garnish with fennel sprigs. Some crumbled feta or goat cheese makes a nice addition. Most of my family finds raw fennel too strong. Sauteing the fennel first, in a bit of oil, mellows the flavor. Put all the following ingredients in a large pot. Add enough water to just cover all. Bring to a boil, reduce heat and simmer until the peas are tender, about 2 hours. Skim off any foam that rises to the surface. Once the peas are soft add salt to taste. To make this a vegetarian split pea soup, leave out the ham (obviously), add an additional carrot and onion and use vegetable broth instead of water.